The demolition of an apartment complex and a Dublin City Council leisure centre and swimming pool will go ahead under MetroLink plans announced this afternoon. The National Transport Authority (NTA) and Transport Infrastructure Ireland (TII) said it has spent significant time and resources into investigating alternatives to demolishing the 70 apartments at the College Gate complex, however they have “reluctantly concluded” that the original proposal is the best option. They will help tenants to find alternative accommodation and pay their new rent for up to one year. In the case of owner-occupiers, they will pay "appropriate compensation" and help them find new accommodation. The Markievicz leisure centre will also be demolished with plans to build a replacement centre elsewhere. The two authorities said their new planned MetroLink route will now see a reduction in the number of homes that will have to be acquired - falling from 105 to 85. They said an apartment building at the proposed station in Glasnevin, which is home to some 40 people, will now no longer need to be demolished. 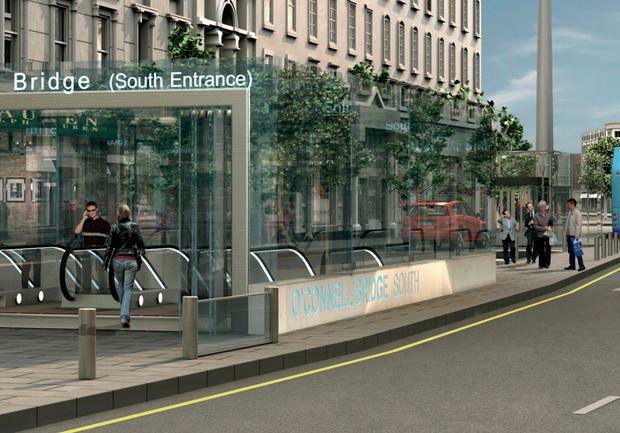 As reported yesterday in the Irish Independent, the new route will now stop at Charlemont. The original plan was to run a 26km railway line linking Swords in the north of Co Dublin to Sandyford in the south, with stations including one at Dublin Airport. The expectation was that passengers would be able to travel the entire route in 50 minutes. MetroLink is due to be completed by 2027. However transport officials were forced to re-examine the planned route following a fierce backlash from local residents, both north and south of the River Liffey. On the northside, the original plans saw Na Fianna GAA Club losing its pitches in Glasnevin for six years during the construction phase and to accommodate a MetroLink station. However the station is now going to be built underneath a training pitch used by Home Farm FC. The NTA and TII said the pitch will be unavailable to Home Farm FC during the estimated three-year construction period, but it will be "fully restored afterwards". On the southside, the MetroLink was to run from Swords to Charlemont Street to meeting the existing Luas and to continue down the Green Line to Sandyford. However this would have involved closing the Luas line for up to four years - something Transport Minister Shane Ross said would be "unacceptable". The NTA and TII said today that, acknowledging the concerns about the closure of the Green Line this will now not go ahead. However the required tunnel boring works to allow for the future connection of the existing Luas line will be carried out during this phase. It also said it has made a number of changes to the original plans in the city centre that will reduce disruption. This includes building a station under the old Carlton cinema on O’Connell Street. The station at St Stephen’s Green will be moved slightly south and west so that Hume Street can remain open during construction. They said St Stephen’s Green park will be “"impacted to a small extent as a result". Announcing the new route, Anne Graham, CEO of the NTA, said; "MetroLink will be a significant economic driver for the region with about 4,000 jobs to be created during construction."